I love that there is no coloring with this stamp. Flowers are so difficult to color, I mean, who can possibly duplicate God's amazing coloring skills of a flower? No one. So best leave it to Him, and just stamp a single color. My card is very CAS, just the way I like them. I did color the center of the flower with Copics, the flower is also popped up a bit using the die and a small dimensional. My next card uses pre-printed Kraft paper on the left side and I added some brown flocking to the flower centers. I didn't like this look as much as coloring the center. The sentiment in both cards is very old and I don't remember where I got it from. These are both beautiful Amy. Gorgeous colors! And thanks for your comment about bunnies in my yard. I do love them in my yard, although those little stinkers ate my pepper plants one year, and since then I have a small garden patch that is fenced in by itself so it is bunny proof. LOL. Love the simplicity of both cards, beautifully done Amy! Both are gorgeous Amy!! 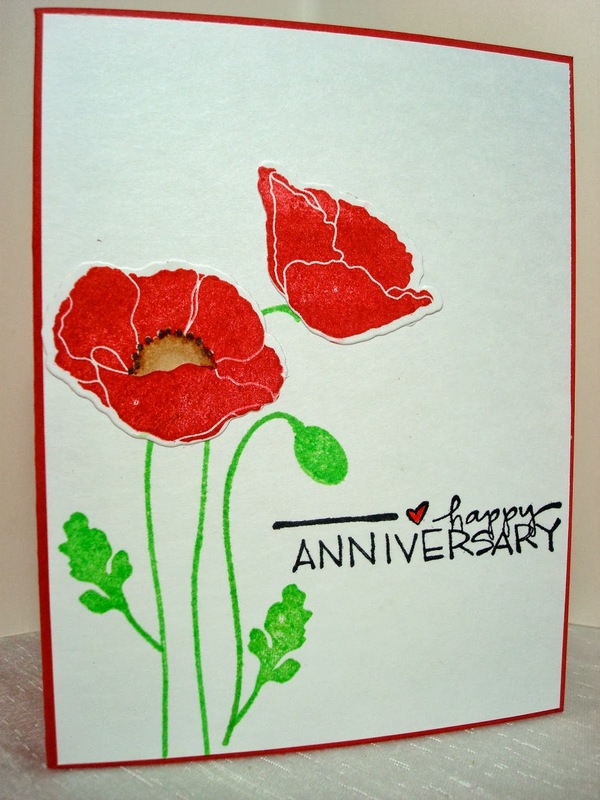 I just love the red poppies against the white as well as the layout with the scalloped border and kraft. Gorgeous! !